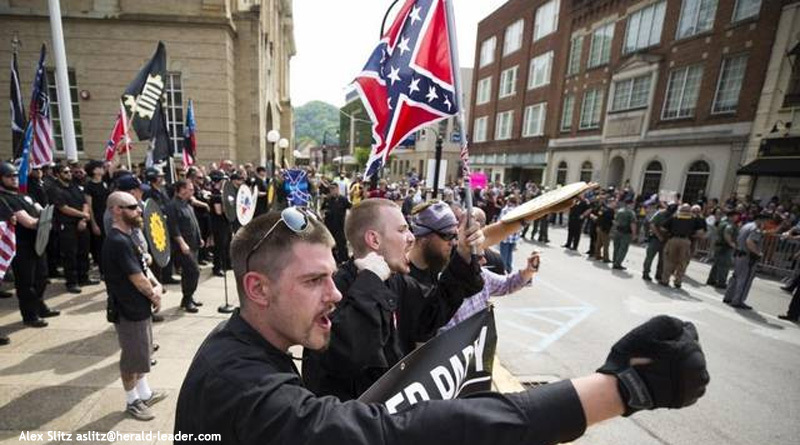 Despite fears of violence, white nationalists and opponents exchanged only words at a rally in downtown Pikeville on Saturday as a heavy police presence and metal barricades kept the two sides separated. At the height of the rally, there were about 125 white nationalists on one side of Main Street in an enclosure beside the historic Pike County courthouse and about 200 opponents on the opposite side of the street behind barriers set up along the sidewalk. A line of local and state police officers stood nearly shoulder-to-shoulder in the street between the two sides as they screamed at each other in the 90-degree heat. The white nationalists hoped to recruit members with a message of help for working people in a place where the economy has been hurt by a sharp drop in coal jobs, but they spent more time condemning their opponents for trying to shout them down. “We see the forces of degeneracy!” Jeff Schoep, commander of the National Socialist Movement, yelled as he looked across the street at the protesters. There was so much noise during the rally that it was difficult to understand either side at times. After about an hour of speeches, the white nationalists left the courthouse and headed to their cars. The opponents, who call themselves anti-racists or anti-fascists, followed them down the street to a spot where there were no barriers. Police formed a line between the sides, and about 40 heavily armed state police officers in riot gear, who had been in waiting during the rally, moved in to make sure there was no violence. A beefy sheriff’s deputy moved up and down the line of police, telling officers to arrest anyone who tried to cross. Donovan Blackburn, city manager in Pikeville, said there were three arrests during the rally. All three who were arrested were associated with the protest against the white nationalists. The event had been in the offing since February, when the Traditionalist Worker Party announced it would hold a rally in town. Other groups, including the National Socialist Movement and the League of the South, announced plans to take part. White nationalists noted at the time that the community was overwhelmingly white and that Donald Trump carried Pike County by a wide margin. They said they hoped their message of standing up for white working families could gain traction in the area. “We know how devastated it was down here,” Butch Urban, an officer with the National Socialist Movement, told the Herald-Leader. The TWP and the NSM include economic measures in their platforms that could appeal to struggling working people, but they are wrapped around a core of racism. The Traditionalist Worker Party “advocates for racially pure nations and communities and blames Jews for many of the world’s problems,” while the National Socialist Movement is “notable for its violent anti-Jewish rhetoric” and racist views, according to the Southern Poverty Law Center, which labels both as hate groups. The website of the NSM says that “only those of pure White blood, whatever their creed, may be members of the nation,” and that all non-white immigration must be prevented. 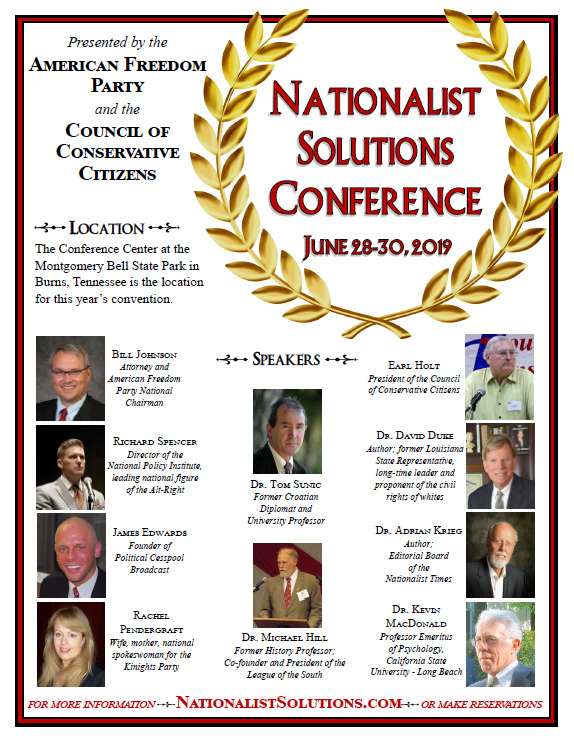 The League of the South, which also took part in the rally, is a neo-Confederate group that advocates for a second Southern secession and a society dominated by “European Americans,” meaning whites, according to the Southern Poverty Law Center. Many people in Pikeville resented the fact that the white nationalists chose their city for the rally, saying few in town would agree with their ideology. Concern grew in town as the rally approached because of information that opponents of the white nationalists would show up in force and there would be a violent confrontation, as there has been elsewhere. When the Traditionalist Worker Party held a rally at the state capitol in California in June 2016, protesters clashed with the white nationalists and 10 people were hurt in the fighting, the New York Times reported. A white nationalist leader said there had been social media chatter among opponents about needing to raise money for bail and medical expenses. Prestonsburg attorney Ned Pillersdorf, who was at the rally, said a lawyers’ group had asked him to be ready to represent protesters if they were arrested. Local residents canceled a rally for equality — initially scheduled at the same time as the white nationalist rally — out of concern over safety, and University of Pikeville President Burton Webb said if parents of students were concerned, they should have their children leave town. Most businesses downtown remained closed Saturday because of concerns about the rally, and the county courthouse, which usually is open until noon, was closed. “Everyone’s anxious — don’t know what to expect,” Blackburn said Saturday before the rally was scheduled to start at 2 p.m. The protesters began gathering before the white nationalists. The protesters said they felt it was important to counter the white nationalists’ racist message, said Daryle Lamont Jenkins, who had come from Philadelphia for the demonstration. “If they see no opposition, they think their work is going to be a lot easier,” Jenkins said. The protesters had been yelling at a handful of people in the white nationalist enclosure for more than an hour when the main contingent of Traditionalist Worker Party and the National Socialist Movement members parked a block away and marched three abreast to the rally site at 3 p.m., carrying U.S., Confederate and organization flags. They also carried a large banner that said “Diversity = White Genocide.” Several were armed with pistols in holsters on their hips, and a man carrying a shotgun was guarding them. Their entrance set off the yelling anew, with each side taunting the other to cross over the barriers. “We are the shock troops for the white race!” Schoep yelled at protesters, while they shouted back. Matthew Heimbach, head of the Traditionalist Worker Party, touched on poverty and drug problems in the area and his group’s economic ideology. “The working class bleeds and the bankers make money,” he said. Each side left town after the rally. Blackburn, the city manager, said he was relieved that there was no violence. He said authorities had done a great job planning for security at the event and putting the plan into action, making sure each side got to exercise its rights while also keeping the city safe. Rob Musick, who pastors the Prestonsburg Presbyterian Church and came to the rally, where he tried to witness to white nationalists, said he didn’t think the yelling ultimately changed any minds on either side of the street.